You may be prepping for Thanksgiving right now, knee deep in peeling apples or wrestling the bird into some sort of brine-y package. Take a break for a moment and look at our 6 suggestions for post-Thanksgiving walks. Think of it as our holiday gift to you. It’s a reminder to all of us that (i) we live in a beautiful area and (ii) we should probably walk off some of that pecan pie. Perhaps most importantly, it encourages us to hop into sweatpants (elastic waistbands, folks!) as soon as possible after that big meal (yes, you’re welcome). We actually reached out to get suggestions from the experts, the staff and volunteers of our active land conservation organizations. Some of these organizations have even gone to the trouble of helping us off the couch by organizing walks that we can join. Showing your gratitude for these wonderful organizations and folks is as simple as just showing up! Pick a place (or 2, or 3 – it’s a long weekend!) and get outside. Westgate Preserve. Photo courtesy of Wareham Land Trust. Carleen suggests the town’s Westgate Preserve because it’s “an excellent choice for Thanksgiving weekend because it’s literally over the river and through the woods!” Featuring a retired cranberry bog and the Weweantic River, Westgate Preserve exudes holiday spirit. Leashed dogs are allowed there as well. More here. Jim tells us that Sippican Lands Trust is hosting its fifth annual Post-Thanksgiving Dog Walk at White Eagle Parcel in Marion at 10 a.m. on Sunday, November 26th. Just take a look at that picture — how great does that look? Find out more here. 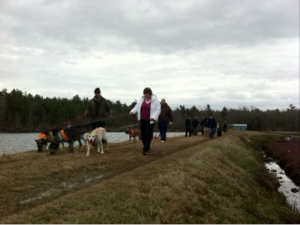 Deb says, “for my walk, I’d have to go with The Sawmill, the Buzzards Bay Coalition-owned public park on the edge of Acushnet and New Bedford’s North End.” She says the trails at the front of the park are wide, flat and accessible so the whole family – from strollers to wheelchairs (and everyone in between) – can journey to several scenic river overlooks at the former home of the Acushnet Saw Mill Company. See details here. Ridge Hill Rainbow. Photo courtesy of DNRT. Kendra says, “Ridge Hill Reserve is a great place for post Turkey Day walk! 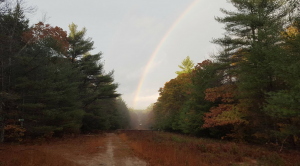 This 175 acre property abuts the Southeastern MA Bioreserve. There are several trails, whether you’d like to take a quick 1 mile stroll along the blue trail, or a longer hike on the red and green trails. The Green Trail runs to the top of Ridge Hill, one of the highest points in Dartmouth. 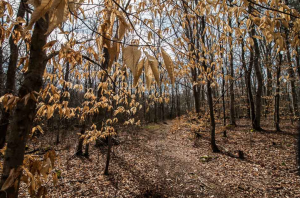 There are several beech groves along this trail, and as of last weekend, the foliage was a beautiful rich orange. The red trail is a bit flatter and easier. On the western most portion of that trail you can get a great view of the Copicut Reservoir. We just put in a new set of stairs on a fairly eroded portion of the blue trail, as well.” See more about Ridge Hill Reserve here. Kendra also mentioned that DNRT is hosting a guided walk on Saturday, the 25th at 9 am at the Destruction Brook Woods (see more about that here). Pardon Gray Reserve. Photo courtesy of Tiverton Land Trust. 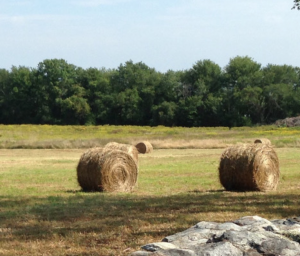 Jennifer suggests joining the Tiverton Land Trust at one of its post-Thanksgiving group hikes at the Pocasset Ridge Conservation Area or Pardon Gray Preserve. For more ambitious hikers, Garry Plunkett will lead hikers on some moderate slopes at the Pocasset Ridge Conservation Area. The newly opened trails will allow those in good physical to experience an amazing forest ecosystem. For the less ruggedly inclined and for families with young children, Wayne Browning will lead a 45 minute trail loop at Pardon Gray Preserve. Both hikes take place on Saturday, November 25 (Pocasset Ridge starts at 1, Radon Gray Preserve starts at 2). Sturdy shoes, fluorescent orange vest/hats are recommended (orange vests will be provided on-site). See here for more details. Herb Hadfield Conservation Area. Photo by Greg Stone. 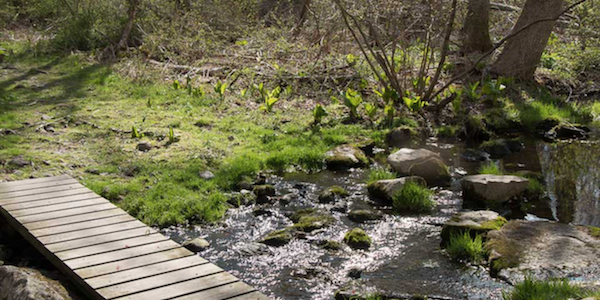 Brendan suggests the Herb Hadfield Conservation Area one of the Westport Land Conservation Trust’s most visited spots. 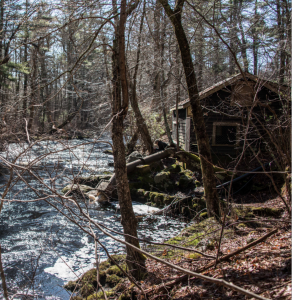 With 158 acres and 2.5 miles of hiking trails, the property features the pristine Angeline Brook, one of Westport’s finest coldwater streams. Trailheads are located at 364 Adamsville Road or 255 Cornell Road. See directions and more here. Make your nature plans and mark the calendars now before your mind is foggy with tryptophan! 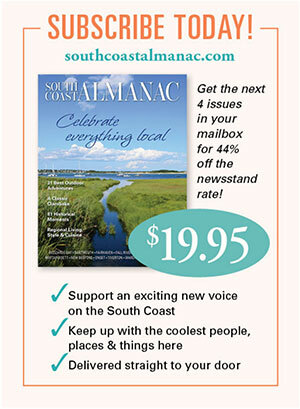 Do you want to keep up with everything local and wonderful — from nature walks to food to people to shopping to events? Yes?! Sign up for periodic updates here. This entry was posted in Holidays, Outdoors, Things To Do, Uncategorized, Outdoors, Walking. I would like to attend the Sat. Hike. Hi Cheryl, That’s great! We think you can just show up for the Saturday hikes (not sure if you are thinking of the Tiverton or Dartmouth hikes) — just click the link in the blog post for whichever walk you want to go on and it will show you where and when to be there. Have fun!